It’s no secret B and I love to trot the globe in search of fine fodder. Yet astonishingly, aside from a handful of trips to institutions such as The Fat Duck and Waterside Inn, we have largely left the UK gastronomic landscape (out of London) unexplored. With the increasing number of talented chefs popping up around the country, it’s a gross oversight on our part which we are now seeking to rectify. Our concerted effort started last bank holiday with a trip to idyllic Cartmel where Simon Rogan’s restaurant-with-rooms resides. Winner of Square Meal’s UK restaurant of the year, L’Enclume champions seasonal local produce, using organic bounty from its own farm and wild ingredients foraged in the surrounding area (we spotted a wellie-clad Rogan returning from his daily forage on both mornings of our stay). We rolled into the usually sleepy village (the races were on the weekend of our visit and the streets were filled with revellers) just after 7pm, a little dishevelled from an exhausting drive. A quick check-in and freshen-up later, we found ourselves reclined in the restaurant lounge sipping champagne. It was our anniversary so we selected a celebratory bottle of Dom Perignon 1999 which was fruitier than customary for a DP (as one would expect from this vintage) but still retained a playful balance between finesse, fruit and acidity. 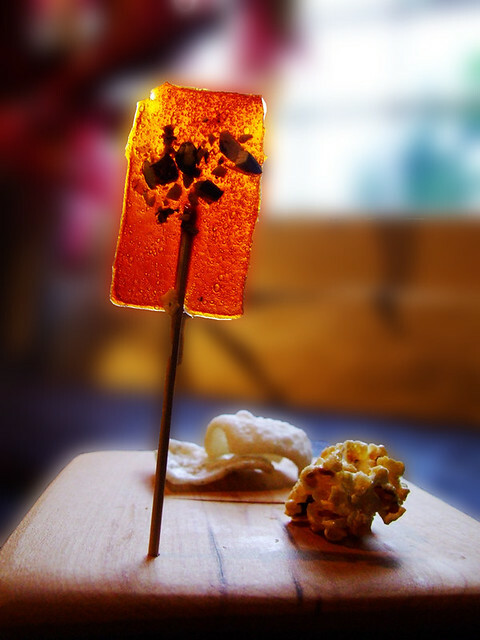 We chose the 12-course tasting menu and got stuck into the canapés – a not entirely memorable selection of red pepper and sunflower seeds lollypop, spiced caramel popcorn and tapioca crisps. 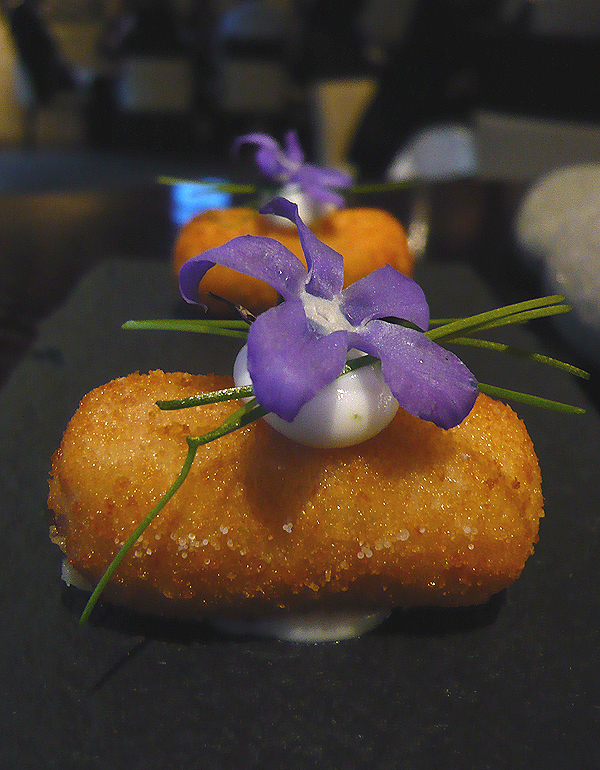 Once done with nibbles we were shown to our corner table in the main dining room and given an amuse bouche of Smoked Eel Fritter, Goats Cheese Mousse, Borage Flower (opening photo). The unexpected combination of eel and goats cheese worked a treat and got things off to a tasty start. 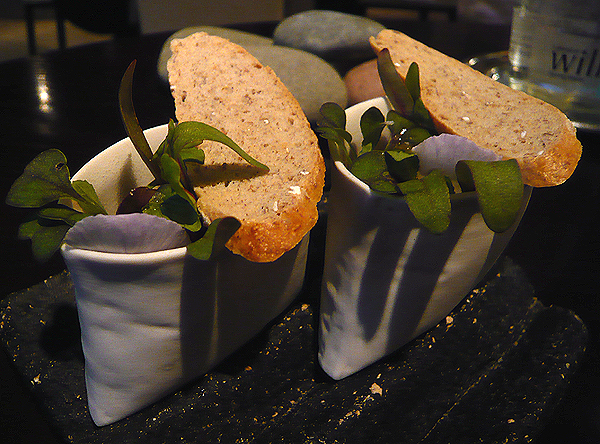 The first course of Cumberland Creamed Chicken Livers, Purple Shoots and Rye Toast was presented in adorable white ceramic pouches crafted by students from nearby Lancashire University (Rogan has lectured there in the past and collaborates with the art department to create vessels for each season’s dishes). The toast and salad leaves concealed a luxuriously smooth chicken liver parfait topped with a layer of sweet, yet tart Cumberland jelly. Well-balanced and incredibly delicious – I wanted to lick the receptacle clean. 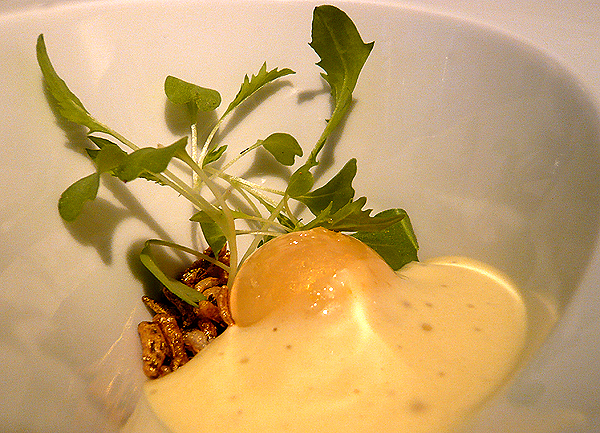 Next was the whimsical Grown up Yolk from the Golden Egg with Crispy Rice and Mizuna Cress, one of the restaurant’s signature offerings. 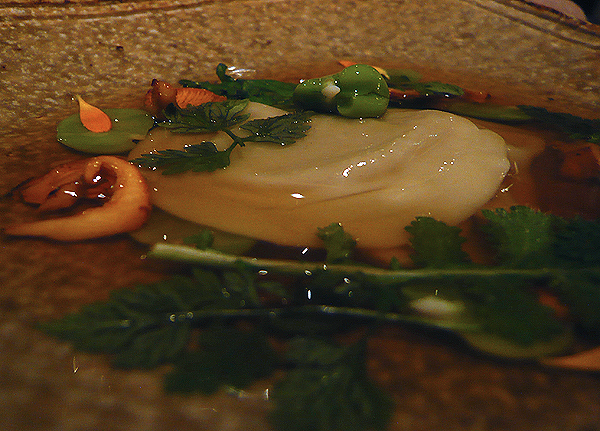 The glistening “yolk” consisted of a vegetable gel membrane which bursts to reveal a chicken velouté centre that oozed with the same viscosity as real egg yolk. It’s a very clever dish both in concept and execution, with the puffed black rice adding a pleasing crunch and the mustard cream melding all the elements together. I can see why it is a mainstay on the menu. 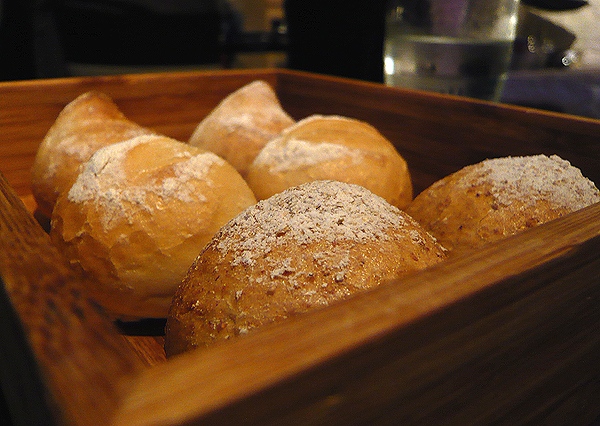 Knowing well that there were plenty more treats in store I tried my hardest to resist the fresh-from-the-oven rolls, neatly tucked in a sleek wooden box. Their inviting aroma proved too enticing and I tore off chunks of warm soft bread, quickly slathering them with salt-specked butter before wolfing them down. The spelt and barley rolls were easily the best, boasting a complexity that made them far more interesting than their wholemeal and white counterparts. I was ready to reach for yet another pristine roll when the well-timed arrival of the Vegetable Broth, Artichoke Dumplings, Chevril, Broad Beans and Alexander seed, nipped my carb fest in the bud. The horseradish-tinged broth on its own was a touch salty, but perfect when paired with the mild ravioli-like dumplings, so silky they practically slid down my throat. Not show-stopping but nevertheless, a very solid dish. The Vintage Potatoes in Onion Ashes, Lovage and Wood Sorrel which followed briefly transported us to Central Asia with its heady spices. A thoughtfully composed plate full of earthy Indian flavours that, with its locally sourced ingredients still managed to retain an air of English provenance. 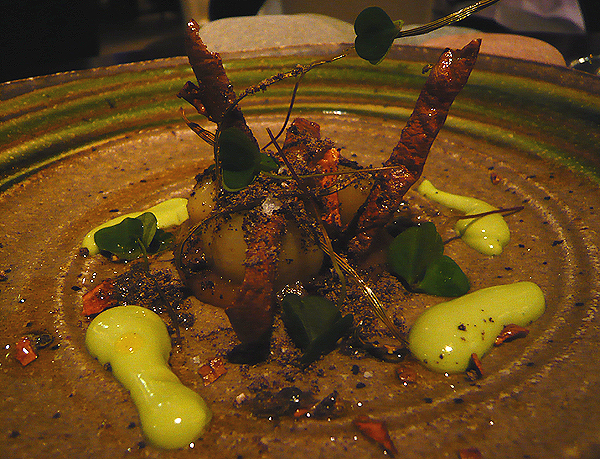 The neutral new season spuds and lovage cream were a great foil to the sweet onion purée, smoky ashes (from onion skins) and bitter wood sorrel. 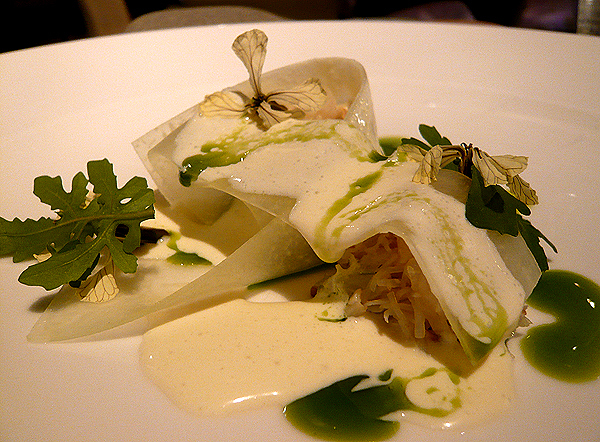 My favourite dish of the evening was the knock-out Muncaster Crab and Purple Azur Kohlrabi with Rocket, Dill and Fresh Cream. The ethereal rocket flower-adorned assembly of delicate crab meat and translucent kohlrabi sheets was a refreshing and exquisite mix of tastes and textures – typical of the understated but precise type of cooking we love. 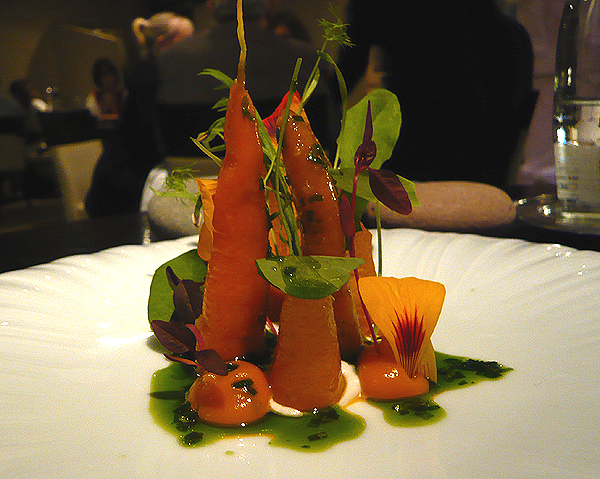 B enjoyed the Sugar Snax and Paris Market Carrots, Ham Fat and Nasturtiums, declaring it an excellent showcase of the humble root vegetable. The natural sweetness of the tender carrots really shone through and the ham fat cream, which was not at all greasy, lent a nice countering saltiness. 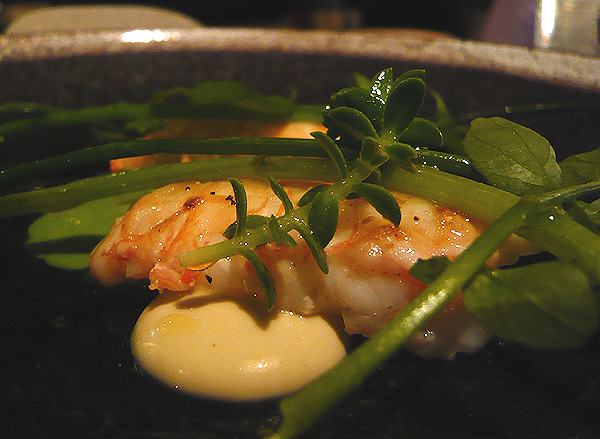 I was keen to try the Dublin Bay Prawns from Guirloch with Oyster Cream, Wild Watercress and Coastal Herbs, as I adored the inspired pairing of langoustine and oyster when I first sampled it at Noma. Unfortunately Rogan’s version failed to come together – the intense sear on the langoustines rendered them tough and the oily oyster cream had an unappetising gloopy consistency. The Loch Tay Artic Char with Finale Fennel, Buckwheat, Mirabelle Tomatoes and Bay Cockles however was lovely. 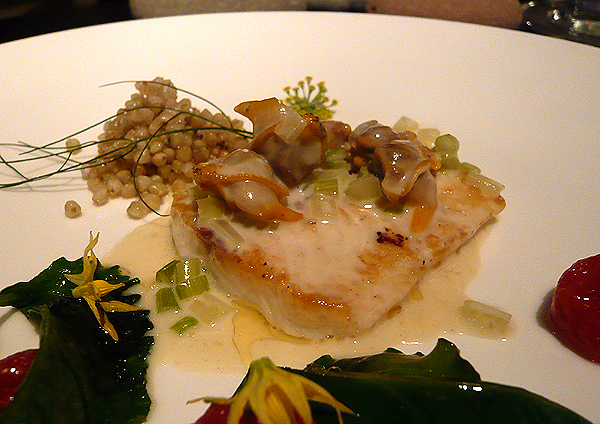 The impeccably-cooked fish was soft and flaky, the fresh cockles plump and the cherry tomatoes wondrously sweet. A seemingly superfluous heap of buckwheat added both textural interest, as well a pleasing mild nuttiness. The savoury portion of the meal came to an end with an artistically arranged plate of Sillfeld Farm Pork, Enorma Beans, White Onion, Parsley and Mugwort Gravy. Despite it being a meat course the suckling pig for me wasn’t the star of the dish, tender as it was it got a bit lost amongst the other perfected-executed components, not necessarily a bad thing as it did make for a harmonious dish. Desserts kicked off with a pot of Gooseberry Cream, Blackcurrants, Yoghurt and Pineapple Weed, garnished with film of crisp blackcurrant leather. Our waitress professed it to be her favourite dish on the menu but we were somewhat less enamoured by it – intense and velvety as it was, I felt the creation was a little one-note. 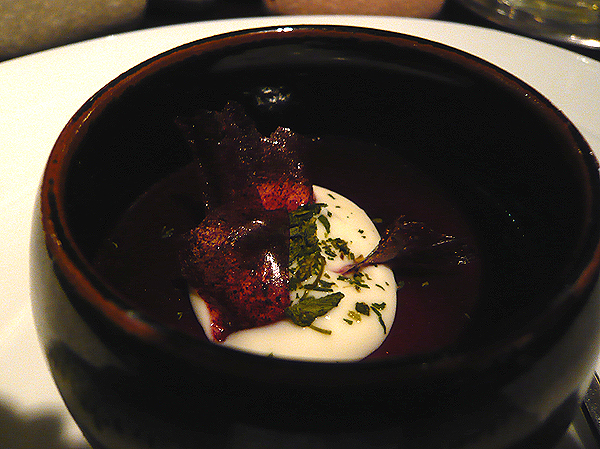 The highlight of the puds was the gorgeous Howbarrow berries, Sweet Cheese, Lemon Balm Syrup and Milk Skin. Featuring delicate red berries, creamy mascarpone and a delectable crisp sweet milk skin wafer, it was light and luscious with a nice acidic twang. A very accomplished interpretation of the beloved millefeuille. 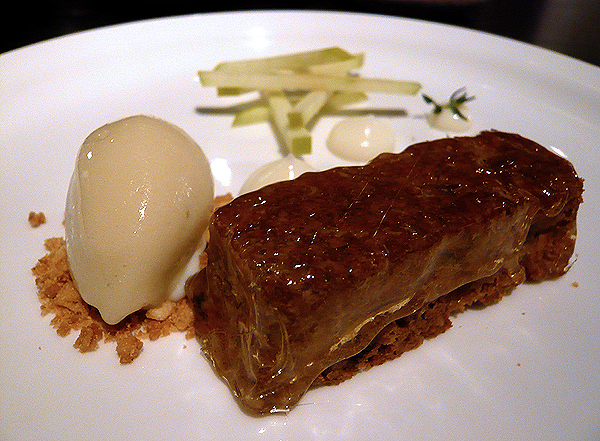 To finish, we were presented with a Caramelised Apple Cake and Sorbet with Thyme Custard and Hazelnut Crisp. The apple sorbet was beautifully smooth and not overly saccherine but it was the apple cake, coated in a thin golden layer reminiscent of the hard sugar shell on a toffee apple, that stole the show. The tart granny smith batons added a welcome crispness to the mix. As with all large meals, we ended with espresso (B) and a pot of mint tea (me) which went nicely with the various petits four on offer; the Douglas Fir Milkshake being particularly intriguing, a shot of pure Christmas. We thoroughly enjoyed the intricate, intelligently conceived food and it was with great contentment that we made the short journey across the cobblestones of the square to retire to our room. L’Enclume is an ideal foodie retreat with its innovative cooking, considerately-sourced produce and picturesque setting (Cartmel is situated in Southern Lake District), and the recently constructed research kitchen Aulis bodes well for future offerings. It certainly is a British restaurant to be proud of, deftly treating edibles gleaned from the surrounding area to bring diners a true taste of the English countryside. If you do plan on visiting, I would suggest avoiding race days and perhaps consider going during Spring and Summer which, according to head chef Mark Birchall are the best seasons for exciting, diverse wild ingredients. 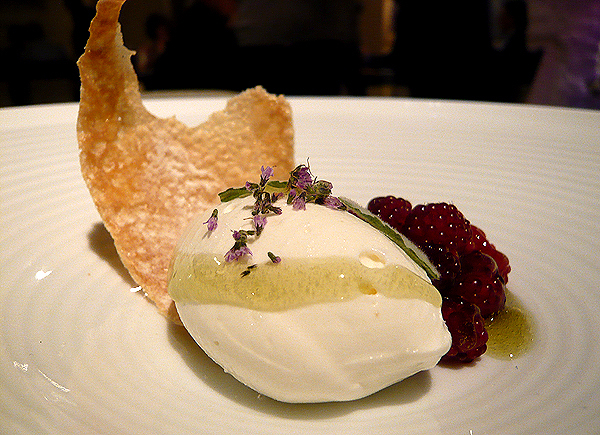 ~ by gourmettraveller on September 8, 2010. GT this is another stunning post! The images are sooooo good! Keep up the good work and well done on your 2000 twitter followers!! GB – thanks, it was a stunning meal! Helena – I would definitely agree about the atmosphere, the decor also could be much improved (although the conservatory at breakfast is lovely). Ed – fantastic, you won’t be disappointed. How nice to see a review up north! Great photos,interesting to read as are planning a trip to the Lakes and this is one of the places we were considering visiting. Had to come back for a 3rd look at the photos , well composed and hey…i take it that it was dark outside so double well done.Dont know if you ever seen my 30 course pig out but heres the pics that i took. Gorgeous presentation of food (and photography), especially the colors in the photos toward the end. Lovely! That looks amazing, excellent photographs. I’m not sure where I would fit it all, but I would definitely try! Thanks for sharing. 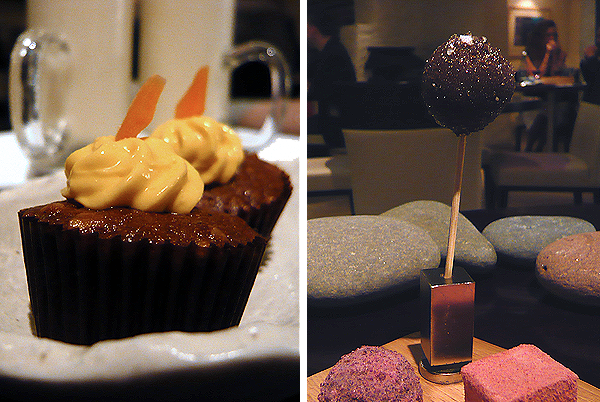 I have only ever eaten at L’Enclume once – in the early days when it had first opened – and I must say I wasn’t wildly impressed. However, I’ve kept hearing consistently good reviews ever since, so I suppose I really ought to give it a second shot. I use a Leica D-LUX 2 and yes, I wasn’t all that keen on taking pics when I started the blog… but you do get used to it! 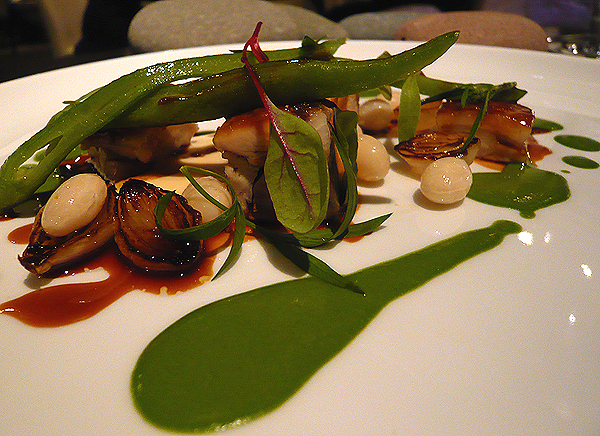 Obviously I’ve not been to L’Enclume in the past, but from my recent meal there I would definitely recommend a re-visit. Leica ??? Camera snob eh ? ;-) I dont even hesitate now , i just get the camera out and start snapping away , or if you`re ever worried then just email them to tell them you like to take pics , they dont refuse free publicity and if the pics are good enough then you might even get asked back to take more.My camera is a fujifinepix and its wonderful , i thought buying a £1000 EOS might make my pics better but was sadly mistaken.For lighting in restaurants my fuji blows the EOS out of the water.Check the fuji out http://www.flickr.com/photos/24726943@N06/sets/ £250 very well spent. it may be a Leica but it’s just a point-and-shoot… nothing as fancy as your EOS! I do want to get a camera with SLR functions at some point but nothing too big as I want to be as inconspicuous as possible – may check out the fuji finepix. You’re right, generally restaurants are fine with photos as long as no flash is used. I’ve only be turned away once (at Marcus Wareing) and I know a handful more that don’t allow cameras, like Nobu and Locanda Locatelli. Going next Friday, can’t wait. I’m sure it’ll be up to this standard.